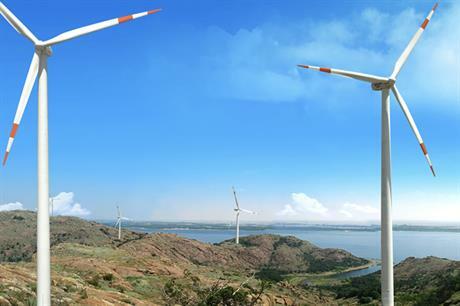 INDIA: Suzlon recorded third-quarter losses in revenue against a backdrop of uncertainty as its domestic market switches to an auction system, the manufacturer stated. The Indian firm’s quarter INR 12.148 billion ($185.7 million) income from operations marked a fall of 55% on the previous quarter and a 56% drop year-on-year. The manufacturer reported a profit of INR 681 million in the third quarter — a 72.07% reduction year-on-year — but was only able to do so after filing for voluntary liquidation of its Brazilian operations in July. Suzlon’s balance was boosted by "de-recognition of assets and liabilities" and "release of foreign exchange gain from other comprehensive income", according to its financial results. But Suzlon’s chief financial officer and chief executive officer remain confident about the company’s future. Its CFO Kirti Vagadia said: "With a strong project pipeline and customer tie-ups, we are confident of quickly ramping up volumes and execution to meet the expanded market requirements. "Our priorities are to continue to ramp up volumes, build strong order backlog, optimize costs across the board, and maintain disciplined working capital level." Meanwhile, Suzlon CEO JP Chalasani said a delay in regulatory approvals in India, as the country transitions from feed-in tariffs to a competitive bidding mechanism, had slowed installations in its home market. However, he remains confident that more than 6GW of installations could take place in India in the 12 months between April 2018 and March 2019, and the country would soon reach the 10GW milestone. "With the newly discovered tariff, wind is competitive with respect to other sources of energy and has emerged a mainstream energy source," Chalasani explained. "We are well positioned to capitalise on the market opportunities," he added.